Over time, most organizations start, grow, thrive, decline, and eventually end. But that’s not God’s plan for the Church. In The Unstuck Church: Equipping Churches to Experience Sustained Health, available now from Thomas Nelson, Tony Morgan has identified the 7 stages of a typical church's lifecycle that range from the hopeful and optimistic days of launch, to the stagnating last stages of life support. Regardless of the stage in which you find your church, it carries with it the world's greatest mission. "Go and make disciples of all the nations . . ."
With eternity at stake the Church should be doing most everything within its power to see lives changed forever. The Church should strive for the pinnacle of the lifecycle, where they are continually making new disciples and experiencing what Morgan refers to as "sustained health." In The Unstuck Church, Morgan unpacks each phase of the church lifecycle, and offers specific and strategic next steps the church leader can take to find its way to sustained health . . . and finally become unstuck. 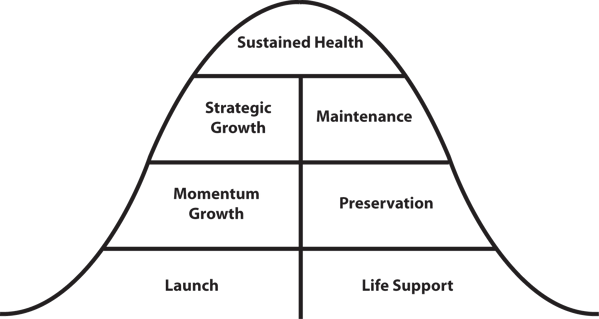 Where Does Your Church Sit in Its Life Cycle? Take the FREE online assessment. How can you pinpoint where your church is in its life cycle today? Take the free Unstuck Church Assessment. You can take the survey individually or with your entire leadership team, for free. View your results, along with recommended next steps based on your church’s life cycle stage, in a downloadable report.